This Buffalo Deviled Eggs Recipe is a fun and delicious spin on traditional deviled eggs. 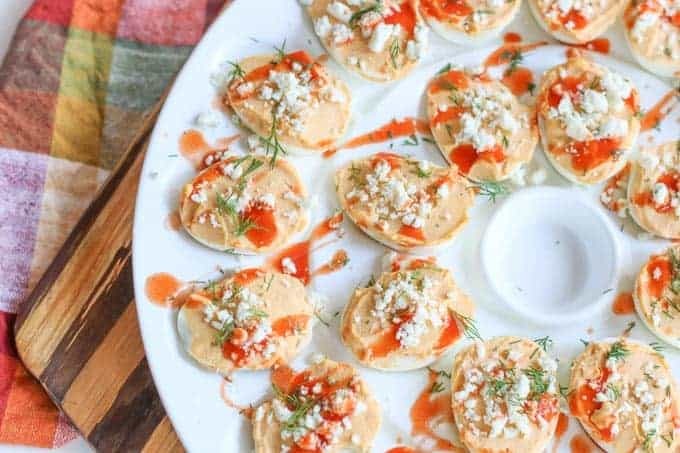 They are made with buffalo wing sauce and garnished with crumbled blue cheese. They make a beautiful party appetizer. 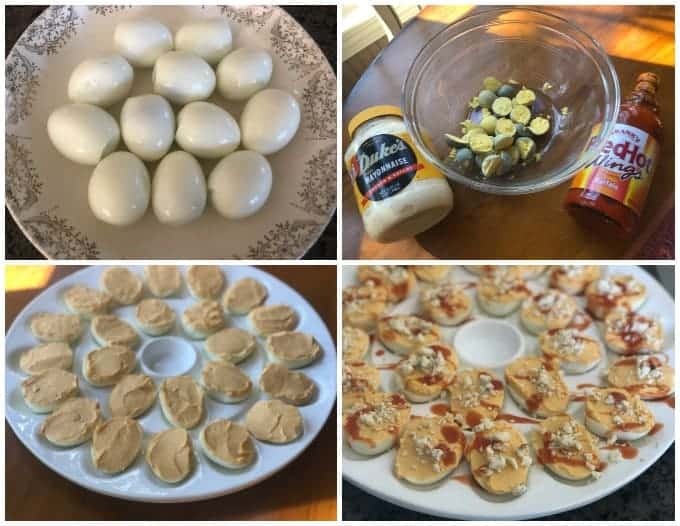 Do you love deviled eggs? 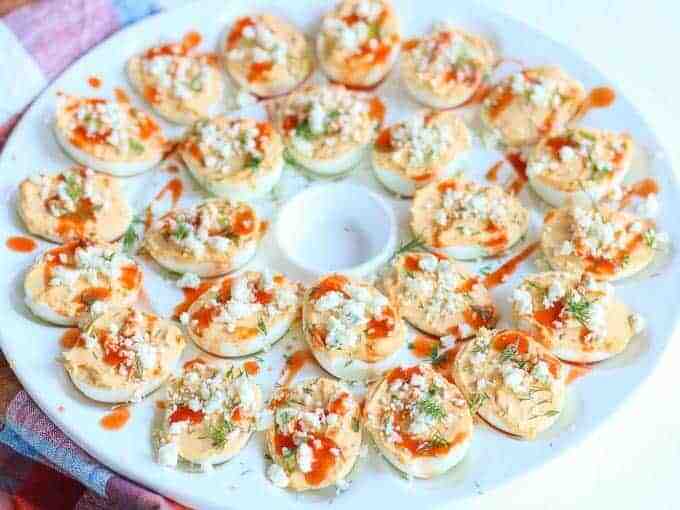 In my house, we can’t have a get-together without having deviled eggs. All of my friends and family love them. So much so, I have several deviled eggs recipe variations on my blog such as: BLT Deviled Eggs, Gourmet Deviled Eggs with Speck Ham and Roasted Red Pepper, and Halloween Spider Deviled Eggs. They are all fun and tasty. These Buffalo Deviled Eggs are not your every day deviled eggs. They incorporate Frank’s RedHot Buffalo Wing Sauce to give them a spicy kick. (You can go hot, medium, or mild! I LOVE the Hot!) I crumble blue cheese for a tasty topping and garnish with slivers of dill for a pretty color and flavor accent. The presentation is beautiful and looks much more fancy than the traditional deviled eggs. My friends and family LOVE them!! Making these buffalo deviled eggs are easy! First, cook 12 eggs. Peel off shells. Slice each egg in half. Remove yolks in a mixing bowl. Mix mayonnaise and Franks RedHot Wings Sauce (Do not use plain hot sauce, it will be different in taste and consistency.) Mix until yolks are completely smooth and there are no lumps. Spread egg yolk mixture over entire egg half. Sprinkle blue cheese crumbles on top. Finalize with drizzles of the Frank’s RedHot Buffalo Wing Sauce for added flavor and color. You can little slivers of fresh dill for pretty contrasting color. Serve! You can make these a day ahead. If you like this recipe, check out my other party appetizers! I have several to choose from. This Buffalo Deviled Eggs Recipe is a fun and delicious spin on traditional deviled eggs. 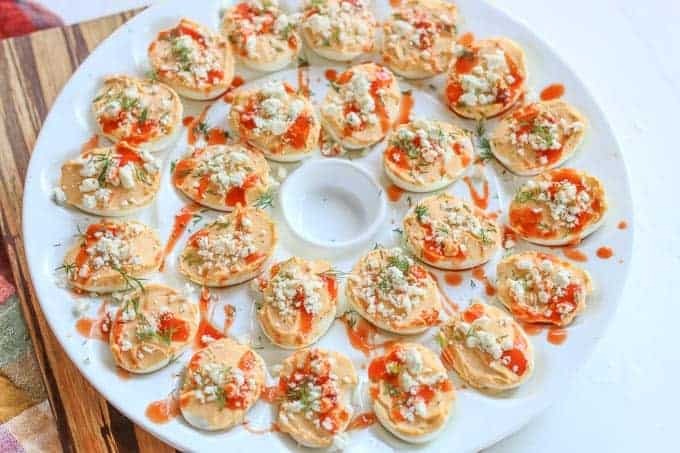 They are made with buffalo wing sauce and garnished with crumbled blue cheese. They make the perfect party appetizer. Add eggs to a large pot. Add enough water to completely cover eggs. Bring to a boil. Cover with lid and rest for 15 minutes. Run eggs under cold water until cooled. Peel eggs. Slice eggs in half. Remove yolk in a large mixing bowl. Add mayonnaise and Frank's RedHot Buffalo Wings Sauce. Mix until all the lumps are gone in the yolks. Spread mixture over each egg halves until completely covered. Crumble with blue cheese and garnish with dill. Drizzle a little extra Red Hot Frank's Wing Sauce for extra flavor and color. 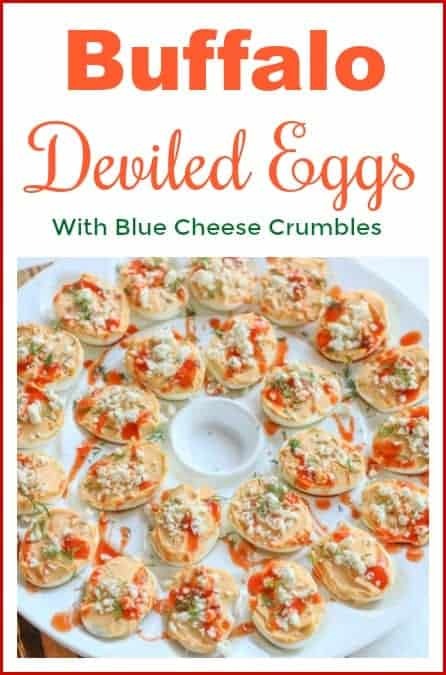 Oh, I love this variation of deviled eggs! We like things hot and spicy at our house, and this recipe is perfect to use up eggs after Easter!